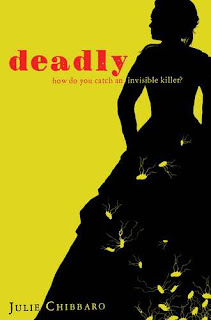 Deadly won’t be the most exciting book you ever read, but I found it plenty engaging. This story of trying to track down typhoid fever is part historical fiction, part detective novel. Books like this make me think of the best teachers and professors I had, that used real books (both fiction and non-fiction), rather than textbooks. And a book that deals with both history and science? Sign me up. The story takes place in 1906 in New York City. Prudence lives with her mother in a crumbling old tenement building. Her brother died years earlier and her father went away to fight in the Spanish-American war and has never returned. They quietly suspect he might be dead, but still hold on to hope that he may someday come home. Somehow, Prudence’s mother has managed to get her into a girl’s school as a scholarship student, which, her mother hopes, will launch her into a better life. Students in their last year can get a job on the side, and Prudence intends to do just that. But when the job she finds, as an assistant to a city employee for the Department of Health and Sanitation who is trying to track down carriers of typhus , conflicts with the school day, she has to decide if she cares more about graduating as a “lady” or taking a job where she can exercise her interest in disease and science. She takes the job, of course, and they begin their hunt for Typhoid Mary, who has never been sick, but might be a carrier, passing the disease from house to house where she works as cook. But it’s hard to convince someone that’s never been ill that they’re making other people sick. Especially someone who is as clean and conscientious as Typhoid Mary is. The story is written in diary form and although that is often not my favorite style, it worked well for this story, as it gives Prudence space to reflect on the moral implications of the work they do. How do you force someone who is innocently harming others not to continue working? How do you prove, in these early days of science, that someone is a carrier? This is a quick read – I finished it a day while we were home for Christmas (ah vacation, how I love you). But I’ve thought about it many times since then; the questions it raises are fascinating and have implications far beyond the scope of 1906. This is the kind of book I’ll be seeking out if I end up homeschooling my children. Sounds very interesting! I love books that raise ethical dilemmas in new and interesting ways. And I too am a sucker for science-y fiction (not to be mistaken for science fiction). Hmmm…I may have to read this book. But why only 7 out of 10?